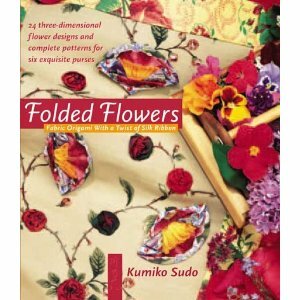 Here is another book you might enjoy about fabric folding: Folded Flowers, Fabric Origami with a Twist of Silk Ribbon, by Kumiko Sudo. These flowers from Japan jump out of the pages... The book itself as a feast for your eyes, with wonderful watercolors and project ideas. To make the flowers stand out even more, I would use plain backgrounds in most of the projects. I've had this book just as long as I've had Rebecca Wat's Fabric Folding book. They are inspirational, and the flowers will make your quilts pop!